The Marching.com Spotlight presents news and articles on topics related to marching bands and pageantry arts. Competition: How important is it? A marching band documentary has been re-energized after the film's subject  Oklahoma's Broken Arrow High School marching band  won the 2006 Bands of America Grand National Championship. 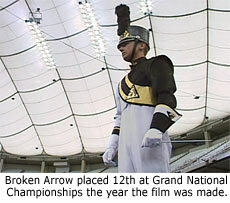 The independent film titled The Pride of Broken Arrow (DVD, 78 minutes) offers a behind-the-scenes look at the band's entire 2001 season, and culminates with a respectable 12th place finish in that year's Bands of America national finals event. Film directors Matt Maddox and Dana Merwin knew that Broken Arrow had a record of excellence, but when the movie was filmed the band's highest ranking at Grand Nationals had been seventh place. Merwin says, "It's very exciting to look back and see a national champion in the making." The filmmakers took great care to capture the full range of emotions that makes up a band season: the staff's stress of creating a competitive show, the students' joy of knowing they gave a great performance, everyone's anticipation of waiting for the announcement of scores. Yes, the film has components you might expect in a band movie, such as performance clips and examples of stamina required when the directors ask the students to rehearse it one more time. But the film goes deeper and is also filled with the unexpected. Most striking is the fact that the cameras had complete behind-the-scenes access. You go into the staff room during planning sessions and hear candid conversations among the directors both before and after competitions. The viewer gets an inside view of the process required to create a world-class marching band program. That candid access is part of what makes the film special, according to band director Scott Tomlinson. "They were at all of our private staff meetings, competitions and some of our homes. After a while, we forgot they were even filming," Tomlinson explains. "I think the finished film illustrates the difficult decisions that we have to make as a staff and that those moments can't be taught in music education classes." After viewing the DVD, you'll want to dig into the extra features including deleted scenes and a commentary featuring extra insight from the people making and featured in the film. 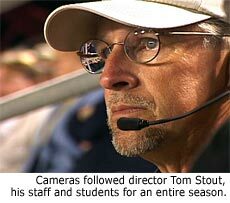 It's a band fan's dream to know that filmmakers invested so much energy to deliver a professional "reality" program centered on the world of marching band. The end product is a timeless look at life lessons learned in marching band: you can't control another band's performance, but you can control your own. And ... competition drives us to new levels of excellence. What led you to create a film about marching band? MATT MADDOX: I marched in high school and was drawn to the dynamics between teachers, students and competition. Our band didn't compete at the national level like Broken Arrow so I was also interested in how these bands deal with that pressure. What we found were teachers and kids trusting each other to overcome obstacles on and off the marching field. What led you to choose Broken Arrow? DANA MERWIN: When we contacted Bands of America in 2001 to recommend programs that were consistently performing well at Nationals, Broken Arrow was one of them. We were also drawn to the fierce marching rivalries in Oklahoma. Most importantly, the band directors, parents and students understood what kind of movie we were making and allowed us in to every staff meeting, practice and even their homes. How many hours of footage did you have? MATT MADDOX: We shot over 200 hours of footage that took over a year to edit down to the 78 minute feature it is today. What has been the response to the film? DANA MERWIN: The response has been very positive from those that have seen the film. Everyone can relate to the story of struggling to achieve success and they are inspired by this band who lets you see every moment of it. People who have never marched, like myself, are always surprised and moved by the talent and passion of these students and teachers. How can people purchase the film? DANA MERWIN: The film is available on DVD through the film's website www.prideofbrokenarrow.com and Amazon.com. We're also interested in having local music stores carry it. If anyone has any questions, they can reach us by email. Copyright 2007 Marching.com. All rights reserved. This material may not be published or redistributed without permission. Working on your next marching show? Find Band Uniforms and Marching Band Music Arrangers in the Resource section. Provided as a service to the marching community. Copyright © 1996-2019 Ken Martinson. All rights reserved. Marching.com™ and the Marching.com Resource Directory™ are trademarks of Ken Martinson.